Miami – WHAT IS JAMES WEARING? While on our recent marvelous Miami retreat, I just had to pry myself away from the pool for a bit of tropical splendor. 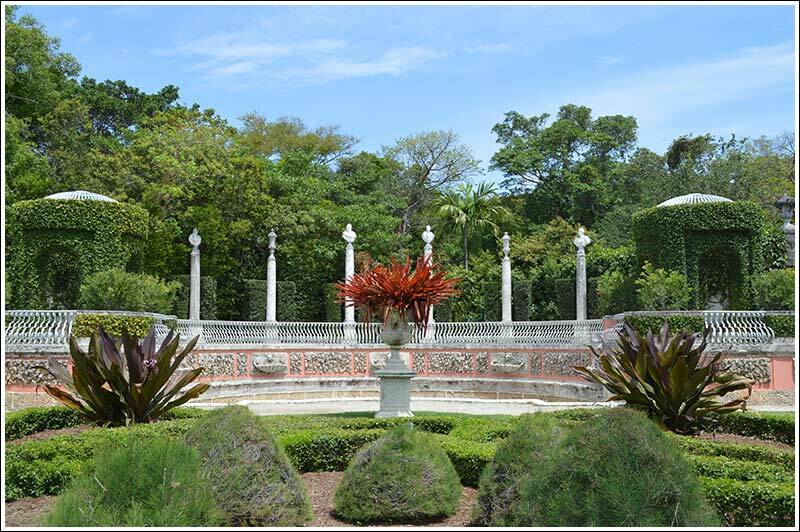 Vizcaya was calling me! I hadn’t been for years and years and I was quite curious to see the restored gardens. 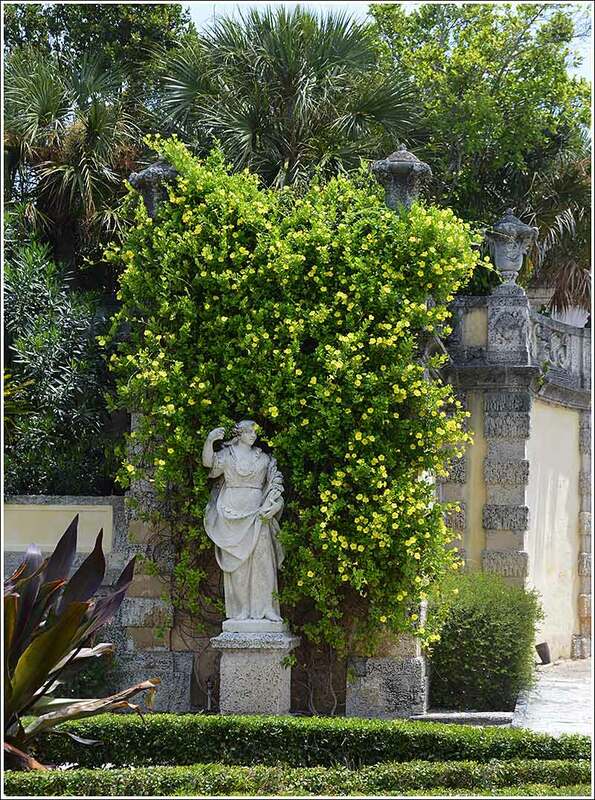 Diego Suarez’s exuberant garden – designed for James Deering – is absolute heaven. There you’ll find an abundance of architectural structures and details, elaborate fountains, and antique and commissioned sculptures. The use of aged sculptures and of soft porous coral stone resulted, quite intentionally, in a weathered appearance that along with planting of mature trees immediately lent a feeling of a garden that had been there for many years. 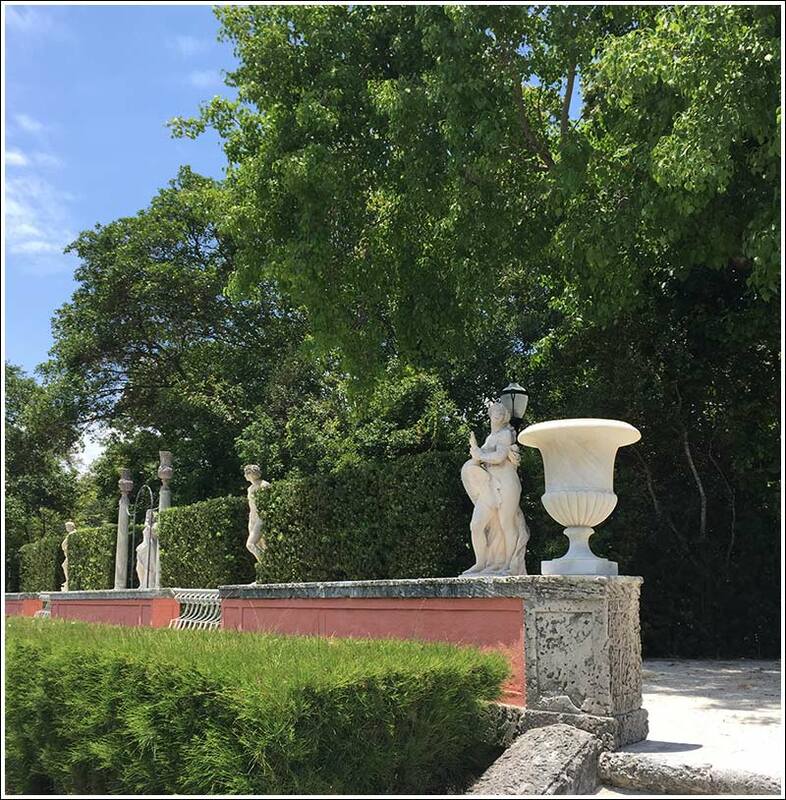 Vizcaya is one of those places one never tires of – I could return again and again and never get enough. It’s a must-see in Miami. With a merging of Latin chic and Caribbean glamor, my exquisite friend Debra Torres’ gorgeous guayabera shirts were the most perfect choice for the elegant tropical setting of Vizcaya (top). The “David” model is my favorite and can be ordered in a slim fit for a more tailored look. 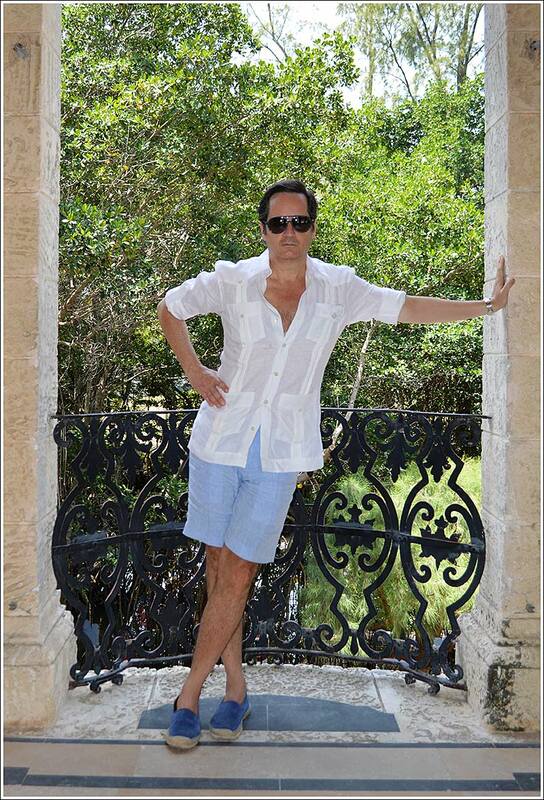 The shirt goes perfectly with a pair of linen chambray shorts and royal blue suede espadrilles. I’m also wearing Tom Ford matte dark blue “Sergio” sunglasses. A spritz of Tom Ford Mandarino di Amalfi completes the look. 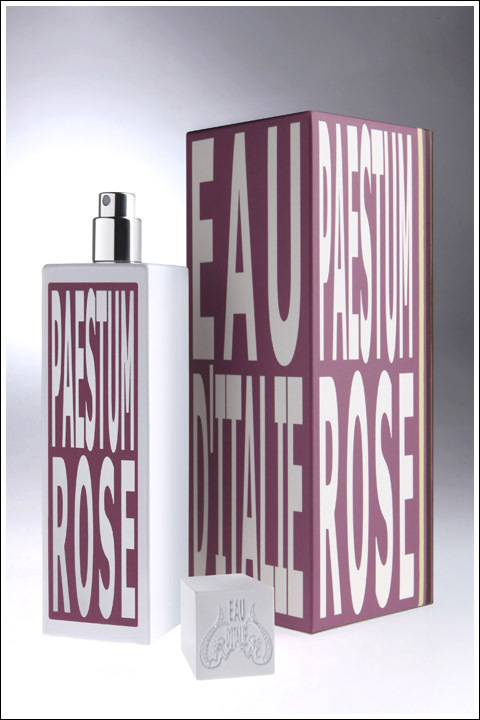 Paestum Rose from Eau d’Italie’s founders Marina Sersale and Sebastien Alvarez Murena and built by perfumer Bertrand Duchaufour. 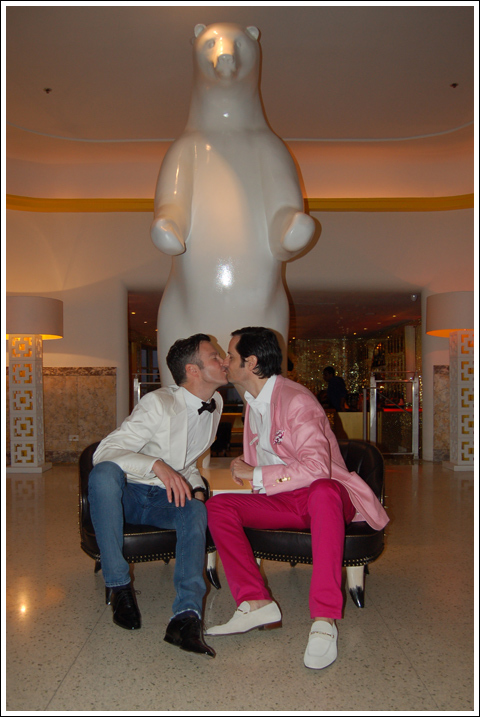 While on our South Beach escape, we had the great pleasure of dining with our very dear friend and hotelier, Antonio Sersale of the incomparable Le Sirenuse Hotel. Over a fantastic meal in the tropical settings of The Royal at the Raleigh Hotel, our conversation turned to our magical stay at Le Sirenuse last summer, and excitedly the seeds of an immanent return to Positano were planted! Until such time as we can revisit, however, I’m comforted by the very next best thing to being there, and that is the Sersale’s Eau d’Italie, Paestum Rose. Like everything that the Sersales do, their line of fragrances is utterly exquisite. With a captivating punctus contra punctum of luxuriant rose and warmer, spicier elements like pepper, coriander, patchouli, myrrh, and exotic woods, Paestum Rose is unusually versatile—suited well to both men and women alike—and while it possesses a deep and undeniably ancient underscore (Pasteum refers to an ancient Greco-Roman city known for its roses), its innovative complexities speak unquestionably to the present. Of course, words fall short, and so I urge you to experience the fragrance yourself! 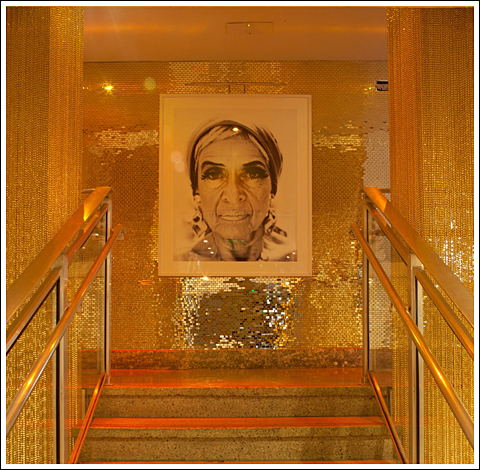 Another way that I stay in touch with Le Sirenuse is through their lovely Le Sirenuse Blog. Established by the Sersales as an ongoing conversation with those who have come to stay at Le Sirenuse, as well as with those who dream of going there, you’ll find pieces written on many varied topics related to Positano, Le Sirenuse, and family life—recently they’ve been publishing a truly touching and oft times humorous series by John Steinbeck written about his visit to Le Sirenuse in the 50’s. Do click over for a delightful read!